4/25/18 An Online Comic Book Collection Auction - Part 2. An Online Comic Book Collection Auction Part 2 Closing 4/25/2018. All items are located at 2426 New Dorset Circle, Powhatan VA. 23139. Over 3000+ Comic Books up for Online Auction! 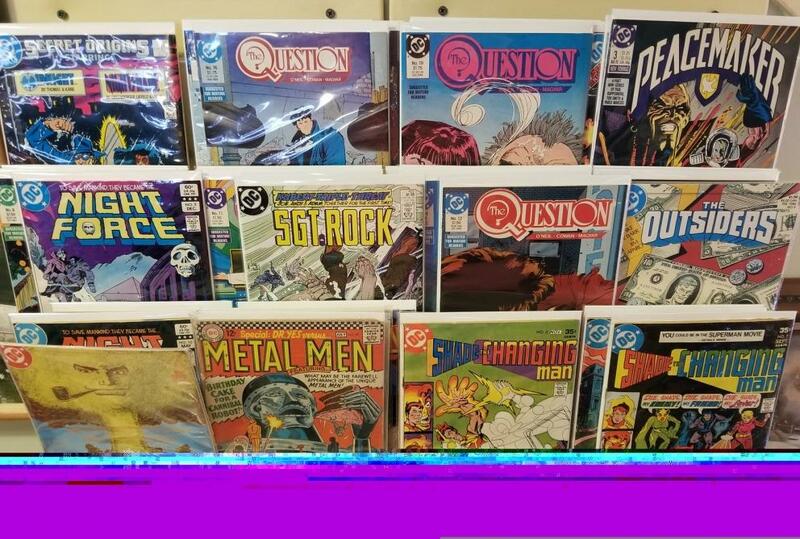 This auction features 800+ Lots of Various Types of Bagged & Boarded Comic Books. Daredevil, Star Trek, Red Wolf, Captain Marvel, Spiderman & More! You can preview these items Monday-Friday between 10AM & 5PM (Closed between 1 & 2PM for lunch) or Saturday between 11AM & 3PM. All items will begin to close on 4/25/2018 at 7:00PM Eastern. All items must be picked up within (2) business days of the auction closing. We are open Monday-Friday between 10AM & 5PM (Closed between 1 & 2PM for lunch) or Saturday between 11AM & 3PM. THIS IS AN ONLINE ONLY COMIC BOOK COLLECTION AUCTION PART 2 ENDING ON 4/3/2018. ALL THESE ITEMS ARE LOCATED IN OUR WAREHOUSE @ 2426 NEW DORSET CIRCLE, POWHATAN VA. 23139. THIS IS WHERE THE ITEMS WILL BE PREVIEWED, SOLD & PICKED UP. YOU CAN PREVIEW THESE ITEMS THROUGHOUT THE WEEK FROM 9AM-1PM & 2PM-6PM (CLOSED BETWEEN 1-2 FOR LUNCH) OR SATURDAY 11AM-3PM. AFTER THE AUCTION CLOSES YOU WILL PICK UP YOUR ITEMS AT THE SAME LOCATION, YOU MUST BRING HELP TO LOAD FURNITURE & YOU MUST BRING YOUR OWN PACKING SUPPLIES ( BOXES, PAPER ETC. ) YOU MUST HAVE ALL ITEMS PICKED UP WITHIN 2 DAYS. IF YOU DO NOT PICK UP, WE MAY CONSIDER THEM ABANDONED OR CHARGE YOU A STORAGE FEE OF $5 PER DAY AFTER THE 2 NORMAL PICK UP DAYS. WE UNDERSTAND IT MAY BE DIFFICULT TO PICK UP WITHIN THE 2 DAYS, BUT PLEASE KEEP IN MIND, WE RUN A VERY TIGHT SCHEDULE AND NEED ALL OF OUR SPACE TO BEGIN ANOTHER AUCTION. BEFORE BIDDING PLEASE BE SURE THAT YOU READ OUR FULL TERMS & CONDITIONS. ALSO BE SURE THAT YOU READ EACH & EVERY DESCRIPTION & PREVIEW ALL THE PICTURES BEFORE PLACING A BID. EVERYTHING IS SOLD AS IS, WHERE IS, WITH NO GUARANTEE OR WARRANTY. IF YOU HAVE ANY QUESTIONS REGARDING AN ITEM PLEASE BE SURE TO CONTACT US. ( 804-598-5099 ) OR EMAIL US ( BILLY@DIXONSAUCTION.COM ). ALSO YOU CAN ALWAYS PREVIEW. AT THE END OF THE AUCTION YOUR CREDIT CARD ON FILE WILL BE CHARGED FOR THE WINNING BID + INTERNET PREMIUM & %5.3 SALES TAX ( UNLESS TAX EXEMPT ). OUT OF STATE BUYERS, WE WILL CHARGE YOUR CREDIT CARD TWICE ( ONE FOR ORIGINAL PURCHASE & ANOTHER FOR SHIPPING ). ALL SHIPPING IS DONE IN HOUSE, WE MAKE SURE WE SECURELY PACKAGE & SHIP EVERY ITEM, WE ALSO SHIP THE LEAST EXPENSIVE WAY POSSIBLE. ALL ITEMS WILL BE SHIPPED WITHIN 6 BUSINESS DAYS. IF YOU HAVE ANY QUESTIONS ABOUT SHIPPING PLEASE CONTACT US ( 804-598-5099 ) & ASK TO SPEAK TO WES.